Are you travelling to Los Angeles for a business conference with your colleagues or going for a joy trip with family and friends? Make sure that you have made all arrangements from booking the tickets, hotels and transportation when in Los Angeles. While most people take care to book flight tickets and hotels well in advance they don’t pay too much attention on booking a transport for travelling within the city or going for exciting excursions in Southern California and around the city of LA. You can plan long road trips by full size 15 passenger van rental with limited mileage or short trips in and around the city. We will give you some sound tips to ensure that you start doing so now with our exclusive 15 seater van hire in Los Angeles. We at LAX Van Rentals offer you a variety of options, at unbelievable cheap rates, the latest models, premium vehicles and an amazing customer service to make sure that your trip will become truly a memorable experience. Our fleet of vehicles include Cargo vans, 8 passenger minivan, 11 seater passenger van E350 , 12 passenger transit van & 15 passenger vans for hire or renting depending on your requirement. When travelling with a big family, kids and a lot of luggage; or a big group of friends and colleagues, our full size 15 seat vans for hire in Los Angeles will be an ideal choice. Everyone will not only have enough space to ride with full comfort and thus enjoy the whole trip much more than travelling in cramped quarters. Our fleet of vans are always well maintained by putting them through routine maintenance checks to ensure unhindered on-road experience. They are cleaned every-day for a clean and fresh look and feel. This goes a long way in ensuring your safety and a healthy experience. When you come to Los Angeles CA and book with us or decide to use our services, we deliver 15 passenger vans on hire in Los Angeles CA without any additional cost to LAX airport terminal. We are the only passenger van rental company in LAX that delivers the van to thier clients at LAX arrival terminal. You can also drop off the van at the departure terminal or in the parking across the terminal. 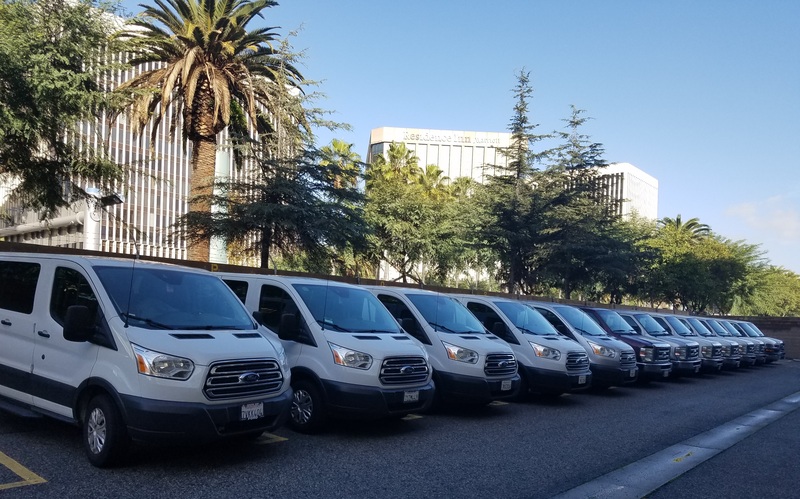 We offer special discounts for all of our full size 15 passenger van hire LA to Non Profit Organizations, members of the U.S. Military, religious groups, Schools and Universities. 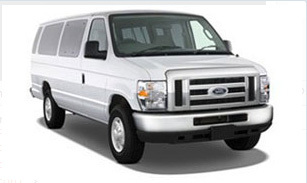 In addition we offer various lax van rental coupons on our fleet of 15 seater vans for rent in Los Angeles. You can book them in advance and get additional benefits by using various promo coupons which you can find on our website. You can also rent 15 passenger vans Los Angeles international airport LAX by calling our Toll Free number at 888-840-1198. Remember that you can always get special discounts and an affordable cheap rate if you book in advance for a longer time. So when you are in Los Angeles California the next time or deciding to visit soon and looking for a transport which is hassle-free, unencumbered, pocket friendly and value for money your choice is quite clear as we foresee all your needs and meet all your requirements to make your visit a truly memorable experience. For samller group LAX Van Rentals offers 12 seat passenger van rental Los Angeles with anti lock brakes, rear swing out van doors with vented glass and removable bench seat that accumadate 12 Passenger (11 Passengers + driver) comfortably. Do get in touch with LAX Van Rentals through our website and also avail the great discounts on cheap full size 12 passenger van and 15 passenger vans offer for you.